An apple a day may keep the doctor away, but after a while it can boring eating the same thing day in and day out. For a change of pace try baking an apple. Add cinnamon, a little brown sugar and a dab of butter and you got yourself a sweet treat that’s good to eat. Don’t bake the core though; you’re going to need to remove that. Also, you’re going to need something to cook it in… something like this Mastrad Fruit Cooker Set . 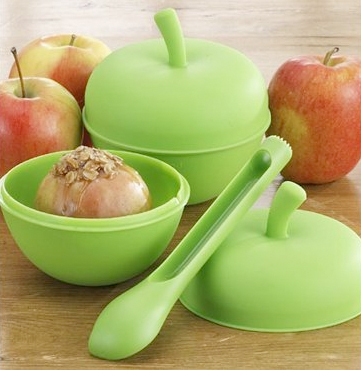 Featuring a combination scoop and corer to complement the fun apple shape, the silicone cooker has the added benefit of reminding you of what’s in the oven.